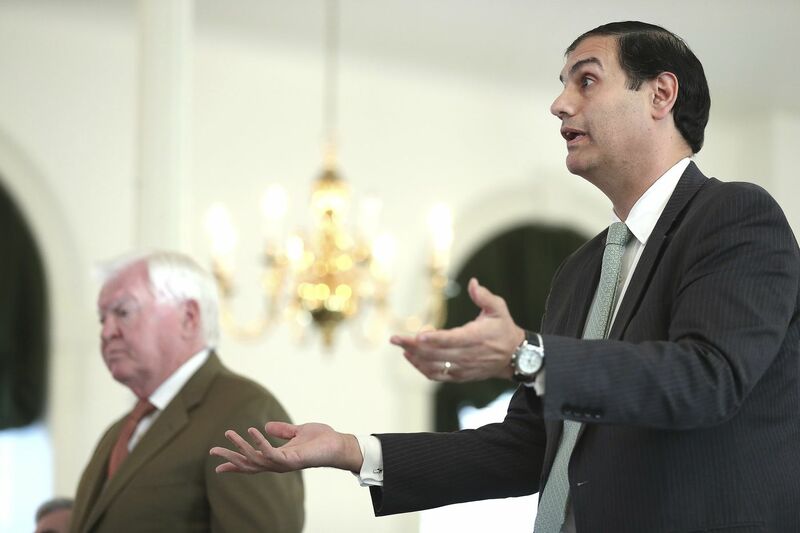 Ernest E. Badway, right, who is the lawyer for the Kate McClure and Mark D'Amico, agrues during a hearing on missing funds in the Johnny Bobbitt case in the Olde Historic Courthouse in Mt. Holly, NJ, Wednesday, Sept. 5, 2018. McClure and D'Amico are accused of mismanaging the money raised for Bobbitt. A judge on Wednesday ordered a Burlington County couple to testify under oath next week about what happened to the $400,000 they raised in a GoFundMe campaign to help a homeless man, Johnny Bobbitt Jr. — money their lawyer says is gone and that Bobbitt says they squandered. Superior Court Judge Paula T. Dow directed Bobbitt's team of pro bono lawyers to request financial statements from the pair before the court closed on Wednesday. At the hearing, the couple's lawyer told the judge they wanted to invoke their Fifth Amendment right against self-incrimination. At issue is whether the couple misappropriated money donated by more than 14,000 people in a campaign to help Bobbitt, who made national headlines when he spent his last $20 to help a stranger, Kate McClure, when she ran out of gas on the I-95 ramp in Kensington. In gratitude, McClure and her boyfriend, Mark D'Amico, started the GoFundMe campaign in November to help Bobbitt get off the street. But that effort dissolved into discord as Bobbitt accused the couple of spending the money for personal gain. In court Wednesday, the judge ordered McClure and D'Amico to meet with Bobbitt and his lawyers on Monday to give depositions about their stewardship of the GoFundMe money. The meeting will take place at a residential detoxification facility in New Jersey where Bobbitt is seeking drug treatment. The judge ordered McClure and D'Amico to testify after they failed to comply with her order to move any remaining funds into an escrow account controlled by Bobbitt's legal team. "You should advise your clients that they are directed by the court to appear," Dow told the couple's attorney, Ernest E. Badway. Judge Paula T. Dow addresses the lawyers during a hearing on missing funds in the Johnny Bobbitt case in the Olde Historic Courthouse in Mt. Holly. McClure and D’Amico are accused of mismanaging the money raised for Bobbitt. Last week, lawyers debated the amount of GoFundMe money left in the account. Badway previously said the couple gave Bobbitt $200,000 of the money, while his lawyers said he was given about $75,000. Then, on Tuesday, Bobbitt's lawyer, Christopher Fallon, said Badway had told him that all of the money was gone. In court Wednesday, Dow called Badway's previous statements on the donations "totally inaccurate." Fallon said he still wants a forensic accounting of the funds because he is not convinced all of the money was spent. "We would be very foolish if we didn't look," Fallon said after the hearing. In court-ordered depositions scheduled to be held Monday, the couple will testify under oath about their handling of the money. At one point, Badway sought to buy his clients time by asking that the case be put on hold until Bobbitt finishes his month-long treatment program. Judge Dow called the proposal "ludicrous." "We already had money disappear," Dow said. "I think that's a ludicrous request." Bobbitt's lawyers contend that the couple fraudulently used donations intended for him in order to "enjoy a lifestyle they could not afford." Bobbitt has questioned how McClure, a receptionist, and D'Amico, a carpenter, were able to afford lavish vacations and a new BMW, while he said they bought him a used SUV and camper, both registered in McClure's name and later sold. Badway said his clients withheld much of the money from Bobbitt because they worried that he would use it to buy drugs. "The idea that my clients are the bad guys … is completely not true," Badway said at a hearing last week. In establishing the GoFundMe campaign, D'Amico, 39, and McClure, 28, told donors they would use the money to buy him a home and set up two trusts to ensure his financial future. Instead, Bobbitt said, the couple put the money into their savings account and spent much of the money on vacations and a new car. Mark D’Amico sent a message to homeless man Johnny after his appearance on Megyn Kelly Today on Aug. 27. Appearing on Megyn Kelly Today last week, the pair told the NBC talk show host that $150,000 of the money remained. Days earlier, they told the Inquirer and Daily News that $200,000 was left from the fund. GoFundMe took about $30,000 from the overall donations, D'Amico said. After the television appearance, D'Amico sent Bobbitt a text message suggesting that Bobbitt abandon his lawyers in exchange for a check. "I say I get rid of my team of lawyers you get rid of yours and Kate and I write you a check," D'Amico wrote in the message, which was displayed in court Wednesday. "Seriously… no bull–." On Tuesday, Bobbitt's lawyers asked Dow to hold the couple in contempt of court for missing a 24-hour deadline to transfer any remaining GoFundMe money into an escrow account. Bobbitt had been living in a camper on property the McClure family owns in rural Burlington County, but in June, he said, D'Amico told him to leave. Bobbitt ended up back on the streets, drug-addicted, homeless and panhandling for food. GoFundMe spokesman Bobby Whithorne said GoFundMe has deposited $20,000 into the escrow account to assist Bobbitt while an investigation into misuse of the funds continues. If fraud is revealed, donors can get a refund of up to $1,000.